Segs in the City is the premium Segway Tour operator in Washington DC. We offer 1 hour, 1.5 hour and 2 hour and 2.5 hour Segway tours of the Capitol, Monuments on the Mall. Whitehouse, Embassies and Cathedral. 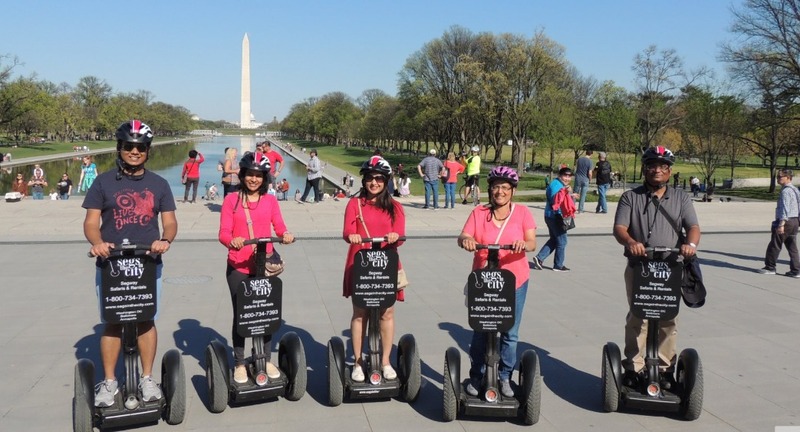 Segs in the City is the first segway tour operator in DC. We offer professional personal service, knowledgeable tour guides, personal listening devices and limit group sizes to ensure maximum customer attention. Segways are easy to use and our guides not only provide expert training, but they offer an insiders knowledge to the local history and happenings. All Safari group sizes are limited in number of participants to ensure your maximum comfort and safety. If you prefer to go it alone we also offer a Segway rental program. After successfully completing a safari all Safari participants are automatically eligible to rent a Segway, but if you prefer to skip the safari you can attend a training session and then rent. Visit our rentals page for more details. Our DC location is on the Concourse Level, outside of the actual Ronald Reagan Building below street level. We are at the rear of the Federal Triangle Metro Station Please arrive 15 minutes prior to scheduled safari time.